The Buick's Envision starting price has been cut $2,195 to $39,995. 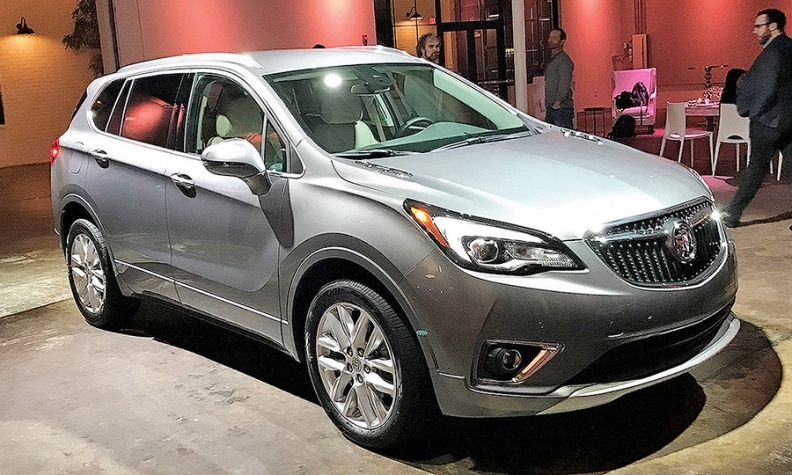 ATLANTA -- Buick is dropping the starting price of the refreshed 2019 Envision by more than $2,000 to increase sales and give owners of the entry-level Encore an easier climb to the larger crossover. The refresh gives the 2019 model Buick's updated grille with a winged emblem and new available LED headlights. Sheet metal changes are mostly in the rear, which features less-rounded elements than the outgoing model. It also has a redesigned hatch and taillights, and rectangular dual exhausts. Buick also enhanced the performance of the available 2.0-litre turbo engine by pairing it with a nine-speed automatic transmission and increasing torque by 35 pound-feet, to 295 pound-feet. Beyond the product improvements, Sam Russell, director of Buick marketing, said last week during a media drive here, "it's about hitting the value equation so those comeback buyers off the Encore can actually make that step in a reasonable fashion." The 2019 model will start at $39,995 when it arrives later this spring. That’s $2,195 less than the outgoing 2018 base model, which starts at $42,190. Pricing for the 2019 Essence trim level starts at $43,995, while the Premium will start at $47,095 and the Premium II at $50,995. All prices include shipping and air conditioning tax. The China-built Envision launched in Canada in May 2016; sales totalled 3,357 units in 2017, its first full year on the market. The Enclave and Encore both outsold the Envision in 2017.